At the Shepard Symposium on Social Justice, we recognize that sustainability and social justice are inextricably linked. In fact, equity is a key aspect of true sustainability. Sustainability practices complement our social justice and accessibility goals throughout the symposium. Thanks to the Sustainability Coalition for organizing “Trash Talker” volunteers to help attendees sort their waste, and thanks to ACRES Student Farm for picking up compost! Encouraging presenters to print minimal double-sided copies of their presentations to support accessibility. 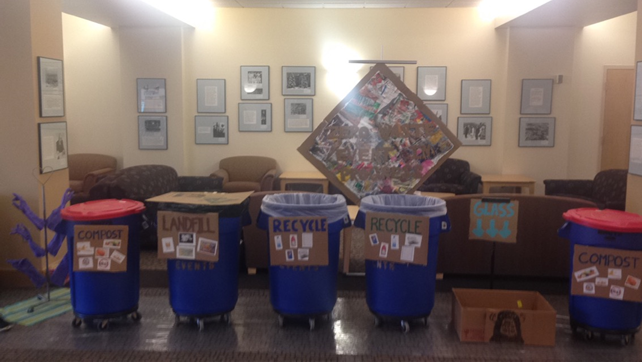 How can you contribute to zero waste and sustainability efforts at the Shepard Symposium? Consider walking, biking, taking public transportation, or carpooling to the Shepard Symposium. Bring your own reusable water bottle, bags, containers, etc. Please take only the food you plan to eat. We work closely with UW Catering to share food with local organizations. Use a laptop or tablet to take paperless notes. 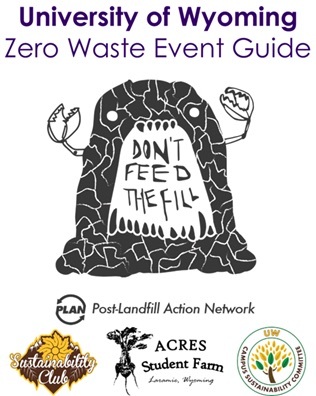 At the 2016 Shepard Symposium, students in the Sustainability Club and the Haub School of Environment and Natural Resources Campus Sustainability course piloted zero waste practices and developed zero waste event guidelines for the University of Wyoming. Thanks to their leadership, we have historically diverted more than 90% of our waste from the landfill at the Shepard Symposium and zero waste practices have begun to spread across UW.